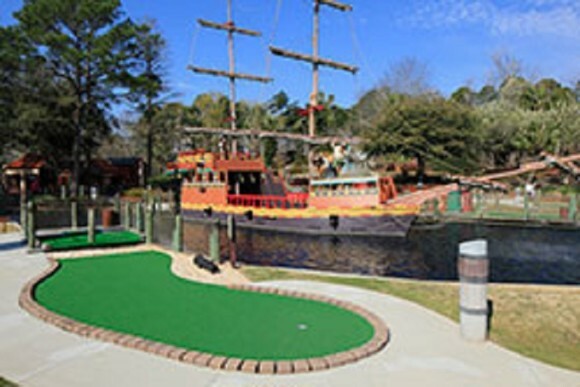 Pirate’s Island offers a unique “Adventure Golf” experience for ages 3 to 93. Follow in the footsteps of notorious pirates like Blackbeard and Captain Kidd, as you begin your themed adventure at our seaside village and depart along the shores of the tidal lagoon. Continue through the caves where pirates buried their booty and explore the mountain to view a panorama of our entire pirate adventure. Extraordinary landscapes, waterfalls, streams and bridges await, as you stroll through this themed setting. Join us for an experience the entire family can enjoy.